If you lose even one tooth as an adult, no matter how young or old you are, you feel the effects. Health wise, missing a tooth or teeth removes a stabilizing effect on your remaining ones. Your smile also changes, which some people find socially uncomfortable. Hermitage Dental Clinic may have the solution, and we invite you to request a consultation about partial or complete dentures at our Edmonton office. A member of the North Edmonton community for 33 years, Hermitage Dental Clinic works with patients of all ages with dental services from preventative care to cosmetic treatments. We are pleased that we can also offer denture services to our established and new patients. Instead of referring you to an outside denture clinic, our general dentists can take you through the entire process in the familiar surroundings of our fully staffed dental office. When you need a dental appliance to replace teeth you have lost to tooth decay, gum disease or dental trauma, a denture not only replaces the missing teeth but also helps to support the surrounding tissues. Not only can a denture improve your oral health but also your overall well-being and happiness. Not only can dentures improve your speech, but you will be able to chew foods that benefit your diet and add enjoyment to your life. Our dentists can offer dentures that closely resemble your natural teeth for an attractive smile all your own. Though dentures can last for many years, you can return to Hermitage Dental Clinic if you need them remade or readjusted because of normal wear or physical changes to your mouth. A conventional denture is made after your teeth have been extracted and the gum tissue has been given time to heal, usually 4 to 6 weeks. While your gums return to normal, you will have to go without teeth before your new dentures are fit. 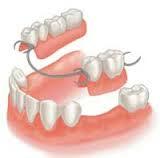 As their name says, immediate dentures are made in advance and immediately placed after your teeth are removed. You won’t have to be without teeth during the healing process, but your gum tissue will shrink as it heals. Then your dentist will have to re-adjust your dentures for a proper fit. Partial dentures are a proper consideration when you have remaining healthy teeth to support the new denture. A partial denture not only fills in the spaces created by missing teeth, but it also helps preserve your other teeth by preventing them from shifting. The process of getting your dentures at Edmonton’s Hermitage Dental Clinic may take several weeks and appointments, with the fit and comfort of your new teeth as our priority. First, your dentist takes highly accurate impressions (moulds) and measurements. These are used to create your custom denture. You may need several “try-in” appointments to ensure the proper shape and colour of the new teeth, as well as the denture’s fit. At the final appointment, your dentist will precisely adjust and place the completed denture, with the purpose of giving you a more natural and comfortable fit. It is normal to experience increased saliva flow, some soreness, and possible speech and chewing difficulty at first. However, this will subside as your muscles and tissues get used to your new dentures. Our clinic staff will answer all of your questions and provide clear instructions about how to care for your new dentures to extend their useful life. Along with properly cleaning your new dentures and good oral hygiene, we also encourage regular check-ups to monitor the health of your gums and jaw.